Mayor Michael Bloomberg announced updates to his sustainability plan that contains hundreds of initiatives to help the city brace for an increase of more than 1 million residents by 2030 while reducing greenhouse gases and implementing other green measures. The skateboarding, punk-loving boy from Harlem, New York, who will protect the Queen at the Royal Wedding By David Gardner Last updated at 11:06 PM on 28th April 2011 Denton John will have a front row seat for tomorrow’s Royal Wedding – as the only American protecting the Queen. The City Council has voted to give New Yorkers a tiny break from alternate side parking rules. A nationwide aid campaign manned by Sept. 11 recovery workers takes the spotlight in “New York Says Thank You,” a Tribeca Film Festival documentary holding its world premiere Thursday night. Teen Accused of Beating Deliveryman is an Honors Student, Mom Says – DNAinfo.com. Though bowling in Manhattan has become complicated by dress codes and expensive food, there are places a subway ride away where nostalgic fans of casual bowling can enjoy the sport. Part of El Museo’s FOCOS series, which highlights groundbreaking, mature, yet underrecognized artists, this traveling retrospective highlights three decades of work by Uruguayan conceptual artist and writer Luis Camnitzer. Born in 1937 in Germany, raised in Uruguay, and working in New York for the past three decades, Camnitzer creates works in a variety of media — including installation, printmaking, drawing and photography — that expose our collective indifference to the violence governments inflict on individuals. A pioneer of conceptual art, Camnitzer critiques current political realities with a perspective informed by his first-hand experience of dictatorships in Latin America. New Bill Would Help Annoyed Residents Avoid Street Fairs, Film Shoots – DNAinfo.com. April 28, 2011 125th Street BID president Barbara Askins is displaying her artwork at Harlem’s Aloft Hotel. HARLEM— Barbara Askins, president and CEO of the 125th Street Business Improvement District, was meeting in her office with the General Manager of Aloft, Harlem’s first new hotel in 40 years, when the hotelier spotted one of Askins’ abstract paintings that had just returned from the frame shop. 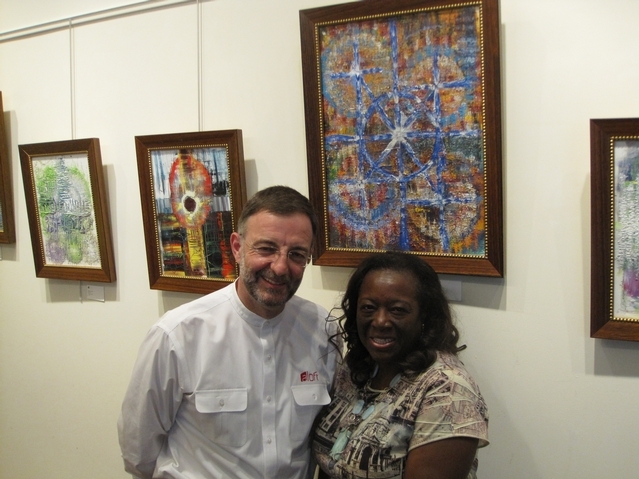 General Manager Daniel Fevre had been looking for an artist to kick off a series of exhibits by Harlem artists in a dedicated art space in the hotel’s lobby and decided instantly that Askins’ abstract painting, “Love of Light” would fit the bill. “He said: ‘I have an idea. Let’s open the hotel with Barbara’s artwork’ and I said: ‘Oh my God,'” Askins recalled. Not many of Askins’ colleagues know about her work as a painter. Most just thought of her as the hard-working head of the BID whose main focus was the marketing and branding of 125th Street, Harlem’s most famous thoroughfare, she said. “People that I work with have been amazed. They ask why I didn’t tell them,” Askins said. Over the last few years, Askins has completed more than 40 paintings, but she hesitated to put her work on display, delaying her response to Fevre about whether she’d participate in his exhibit until just before the hotel’s opening, when he demanded an answer. After sitting down with some of her work, Askins noticed a theme and put together “Choices” — which is currently on display in the hotel’s lobby for another several weeks. The paintings, which Askins describes as abstract, spiritual works, feature the use of texture and rich color. With names such as “God Is,” “Sacred Sun,” “Love of Light” and “Perfect Peace,” Askins says her paintings focus on the paths people travel in their lives and the things they discover about themselves and life along the journey. The show is dedicated to her mother who encouraged her to continue painting before she passed away three years ago. Askins sometimes sits at the bar at Aloft and watches how people interact with the work before she goes over and introduces herself as the artist. “it’s so interesting to see which works people are attracted to. They’ll look around and they often keep coming back to one piece that’s about what’s going on in their lives at the time,” said Askins. Askins said her ultimate goal is to become well known as an artist before she retires. She doesn’t want to give up her day job because she enjoys the challenge of improving 125th Street. “The art is not paying for my living so I get to create how I feel. If I’m painting I’m happy or if I’m working with the BID I’m happy,” Askins said. Fevre said his goal is to exhibit three to four different Harlem artists per year in the space. Requests to exhibit in the space have been flooding in since Askins’ exhibit launched. Aloft is partnering with the Harlem Arts Alliance to help choose which work to exhibit. “I’m glad my work has been received well and I hope i set the bar high,” Askins said, with a nod to her artist side. “But I want someone to come and outdo what I’ve done because this is good for the community and good for 125th Street,” she said, with her CEO hat firmly in place. City Councilwoman Margaret Chin, whose district includes Chinatown, is proposing legislation to criminalize the purchase of trademark counterfeit goods. Keith Wright: Donald Trump Is "Off His Rocker"